Since the beginning of this year, I have been posting income reports for 2 sites that I purchased back in January of this year. These were the first sites that I ever purchased, and so they have been a learning experience for me. Hopefully what I've been able to share so far has been a helpful case study for anyone else looking to buy their own sites as well. As you may recall, a lot happened in the month of September when it comes to private blog networks. In particular, I received a thin content penalty on lots of my sites that used a PBN as I explained here. As a result, one of the sites that I purchased received a penalty as well, and so the earnings for October will be much lower than September. 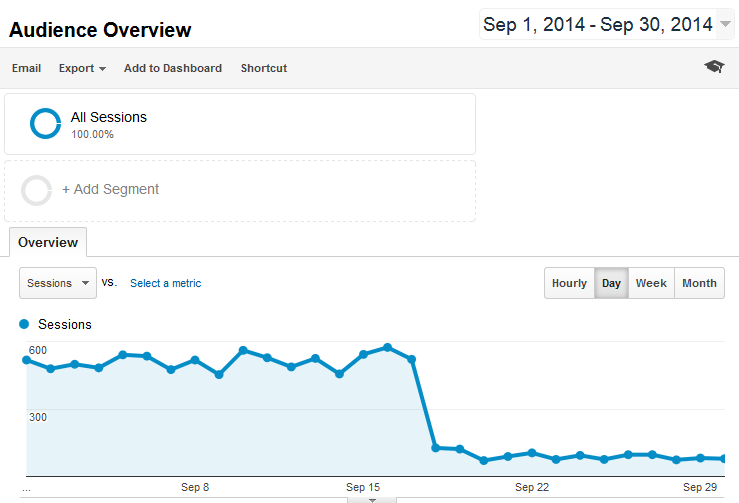 However, the other site was not penalized as all of its traffic was coming from Pinterest, rather than Google. Let's dive into the report! 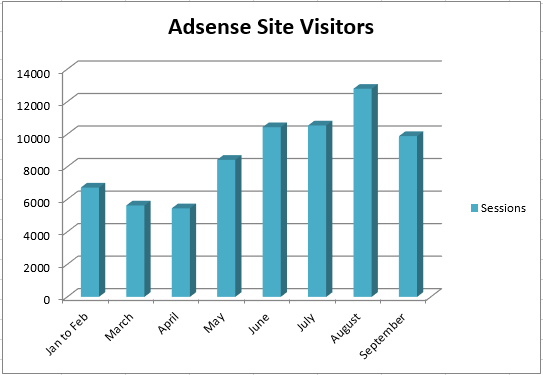 Below you will find all the stats for my “Adsense” site. This is the site I purchased in January this year for $5,000 that makes most of it's income from Google Adsense. By simply looking at the numbers for September, it doesn't look so bad. In fact, it was my second highest month ever! However, the income numbers don't tell the whole story. This site was penalized in the recent PBN and thin content update. So, this site was actually on track to earn over $500 this month, but was hit on September 18th because I had used PBN links on the site. So, the site went from getting 500 plus uniques a day down to 80 or so. Not cool. 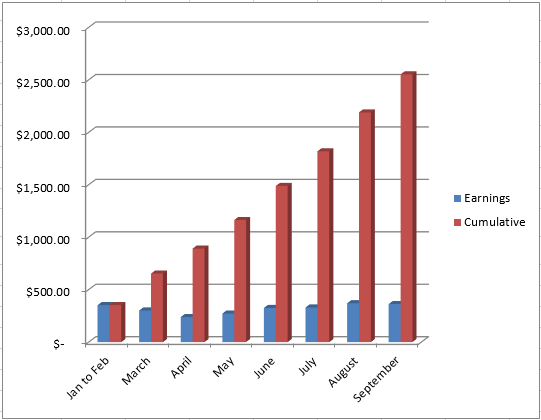 So, here's the earnings graph, but its going to be much less for October. I expect the earnings to drop to around $100 to $150 for the month of October. Ouch! Through the end of September, the site has made $2,552.35. Since I paid $5,000 for the site, I'm still about $2,500 negative. I wish I could say I had a clear path to recovery; however, I suspect this will not be an easy penalty to overcome. In fact, before I put a ton of effort into these smaller sites, I'm keeping a close eye on Perrin with aPennyShaved.com. He's been going through and putting a TON of effort into recovering that site; and so far his reconsideration requests have been rejected. If he can't recover aPennyShaved.com, I'm pretty sure I'll never recover these smaller sites. I may just try to sell this site since it should continue making around $100 to $150 a month. I may be able get close to my money back. Then I can just chalk this up to a learning experience, which is really all these first site purchases were supposed to be for me. The second site I purchased this year is a site getting most of its traffic from Pinterest. I paid $2,100 for this site in January of this year. The good news about this site is that it wasn't penalized! Because the site was never getting any traffic from Google, even if a Google penalty had been applied it would have no impact whatsoever. The earnings are down a little bit to $231.33. However, I can live with that. The traffic overall was pretty even from August to September. However, it's clearly down from its high back in February and March. I could manually start getting more active on Pinterest to increase the traffic, but I don't see this site as ever being a huge money maker. The good news is that this site has basically broken even at this point! If you include October, the site has now made more than my initial investment of $2,100! So everything the site makes now is all profit…it's a nice feeling! If I decide to sell the site, I could potentially sell it for over $4,000. I would love to chalk up a nice $4,000 profit and take the lessons I've learned through this experience and move on. Last month I referenced a “site 3” and “site 4” that I had purchased. Very similar to this Adsense and Pinterest site; one of those sites was penalized and one was not. Dealing with penalties is no fun, and I do not have much confidence in any type of recovery. The good news is that even though “Site 3” was penalized, I still may be able to turn a small profit with it. The site had made over $10,000 before it was penalized and should continue to make a few hundred dollars a month. I could probably sell it right away to recoup the remaining initial investment of $15,000. The better news is that “Site 4” was not penalized because we had never gotten around to building PBN links to it. The site did about $2,000 last month in Google Adsense, and is on track to do a little bit more this month. If I sold “Site 4” at 20 times monthly earnings, that would be about $40,000. This would recoup more than my total investment of $37,000 on all 4 sites. So, despite the fact that 2 of my sites had penalties, my money is not wasted. I've learned quite a bit, and I very likely will still turn a profit on these sites. Overall, I feel like I'm a much more experienced site buyer than I was 10 months ago. As a result, I feel like I'm in a better position to buy additional sites either this year or next. I'm still excited about the possibilities that can be found in buying and selling sites, despite some of these bumps in the road. I hope you've enjoyed my journey this year as I've shared the ups and downs associated with buying websites! I'll continue to share updates as they occur. As always, I'd love to hear your thoughts or any questions that you might have in the comments below. Niche Site Project Income Report for August 2013! 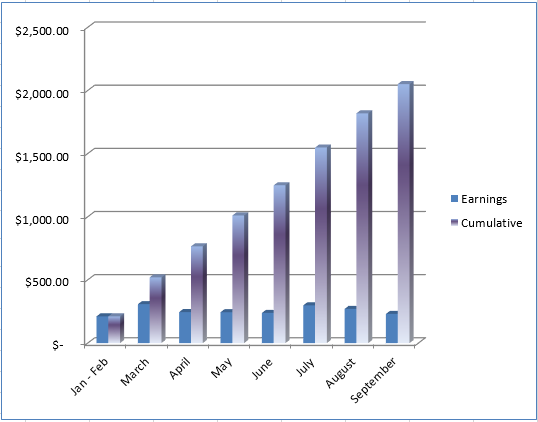 Niche Site Project 2: Income Report for February 2014! Alright Google, You Win…I’ll Never Use Private Blog Networks Again! I always love it when people comment without reading the blog post…don’t you? Well, they accomplish the goal and place their link on your PR3 site. They believe that they will achieve benefit from it!! Such people always try to make links which aren’t gonna help them but still he got your attention. Aha. I always read post do a beautiful comment and I am not getting any reply from your side. I love when people don’t reply to my comment. Don’t get upset, Nitin 🙂 Someone else may read your comment and reply to it. However, I agree, that leaving comments unanswered especially when a commenter asks for advice is not nice. From this perspective I like Neil Patel’s approach – regardless of tons of comments he tries to reply to each and every comment. It’s much hell of work, but it pays him back I believe. At the same time, another strategy is not to care about comments much (or close commenting at all), like copyblogger. Finally, if you are leaving your comments anyway, you still get something from it, don’t you? If you look at all my past blog posts, you will see I’m extremely active in the comments. Sorry Spencer, I did not mean to say you are not. Quite the opposite, I find very useful stuff in your comments and in the comments made by your readers. I replied to Nitin regardless of your blog, which was not clear, I admit. Okay, no worries 🙂 Thanks for the clarification…I really do enjoy the great comments here. I read 100% of comments, and I reply to most comments with a question. Nice? Congrats? What are you illiterate? That was the most depressing post I have read in the last 2 years. Why are you so harsh on this innocent Guy? congrats sir. You always rock. What program do you use to make all the charts and graphs? Hope you recover the penalized sites and grow your income. I love the fact that a purchased site requires so little work! AND so little waiting for earnings to roll in. If you have money to invest and can wait a few months to pay off the purchase price it seems like a really good option. I look forward to more on this topic! Yes, but the problem with purchasing adsense sites is that you are dealing with experienced internet marketers that built the site and fully understand the perils of google. Many of these adsense sites will be stuffed with PBN links. PBN gets hit, and you just lost your cash flow and investment. This is the moral of today’s post. Right, but simple math still makes it a pretty decent investment. If you pay 20x monthly earnings and then they fall to 1/2 of what they were when you bought it, it’s still an annualized return of 30% before expenses. Example: Site is making $100/mo so you pay $2000 for it. Earnings fall to $50/mo but that’s still $600 year on a $2000 investment. Apologies if you’ve already answered it… How do you make money from the Pinterest site you purchased? So sorry to hear about you and Perrin taking a hit, but glad you are diversified and confident enough to not be scared out of the business. I was rejected by Media.net, and I know you were on your 1st attempt as well. Can you share how you eventually got approved (or point me to the post that discusses it, if I missed it)? Thx. Hey Celeste, media.net approves each site individually (unlike Google Adsense that allows you to post to any site once your acct is approved). 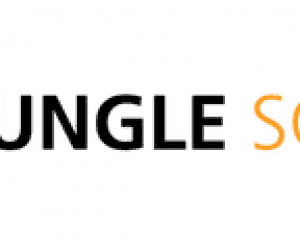 So, while my survival knife site was never accepted, this other site was approved. I don’t know all the reasons why some sites are approved but not others. I had a similar experience. Two sites were accepted and two rejected. I do not know what is their criteria for approval, as all sites had relevant content. Man that’s a shame about aPennyShaved. Perrin worked hard on that site. It is always very inspirational to read these posts. They really help me stay motivated. I have to admit that I have been wanting to throw in the towel on my project several times – but reading your posts makes me want to give it another go. Also you don’t need to build links to rank. Keep customer first with good quality content. Thanks Spencer for sharing details to such depths. Sad to hear that Perrin’s site reconsideration request was rejected by Google ! I see that the site was (is) really good and didn’t deserve google penalty. I feel that the penalty doesn’t really has anything to do with PBNs or links but about the content on the site that google felt that more aggressive on affiliate part. Because in your earlier post you mentioned that the message was ‘thin content’. If it was about PBNs, the message would have been ‘unnatural links’. How about adding adsense to your niche sites so that the manual reviewer thinks twice before applying penalty? Just a thought..
Nice to hear that pinterest site is doing great. Thanks for the update Spencer. The more time that goes by, the more I’m realizing that I just need to focus on 1 or 2 large sites, and diversify my traffic. Time to get away from relying on Google for eyes on my sites. It’s good that you learned a valuable lesson, which is what really makes a difference in the end. I had almost considered getting into PBNs a while back (looks like you took the hit for me)! Anyway, I look forward to seeing your progress on these sites in the future, Spencer! Sorry to hear about the loss on two of the sites, but on the positive they are still at least in the index and earning at least some money. Appreciate the reports and the honesty in which you share how you’re business is doing. Sorry about the loss in traffic and income. Are you going to avoid sites with PBN links in the future, if you buy more sites? I have not heard from you concerning the SaaS app idea. Yep, we’ll provide more updates in the future. Perrins articles were all hand written and they contained top notch information. Very very well written. But its toast now. His SEMrush is flatlined. This is like having a really beautiful girlfriend that you absolutely fell in love with, and she gets drunk one night and cheats on you. Things will never be the same. He still has a bunch of long tail 5 cent keywords, but the stinky finger of Google has now tainted his girl. Sorry Perrin. Hey Spencer – Do you have an article that talks about optimum Adsense placement? Thanks Spencer! I appreciate the link! To get an adwords account is free, you only need an email address…don’t even need a credit card. I listen to every podcast but never comment! sorry! You mentioned selling your penalized adsense site, if that’s still the case and you’re interested in selling it to me please contact me. Thanks Ed…glad you are listening and finally commenting :). If/when I decide to move forward, I’ll contact you. Thanks! I’m glad not all your sites were penalized and that you’re experiencing a recovery and can recoup your investment. I have to admin, you’ve got my thinking about buying sites now and I completely blew that approach off in the past due to risk. However, if someone’s proven a niche (even in a small way) and I can leverage the work they’ve done to go from -0- to whatever in 8-10 months, that’s starting to look good. Nice to see that your pinterest site is doing steady income. I am in the process to build Pinterest audience for one my AUTHORITY type site and know the GREATNESS of Pinterest to send flood of traffic. I dont know why you are thinking to sell the site when you can simply hire a person to create and run a pinterest account for your site. He can to repin all the images on site to Pinterest and traffic will boost for sure. Great that you still can sell all your websites and walk out with the same money. Sad that Perrin’s website was penalized. You guys did a lot of work to build it from scratch. Keep us posted about website #3 and #1 that were penalized and what is your strategy to recover it. Btw what Perrin is doing to recover apennyshaved website? I read it and surprised that google rejected reconsideration. I guess the most powerful will be to obtain edu, gov and other authority backlinks. I really don’t think more or better links will remove the penalty. I don’t usually leave comments but I’d like to say thanks for your continued transparency! 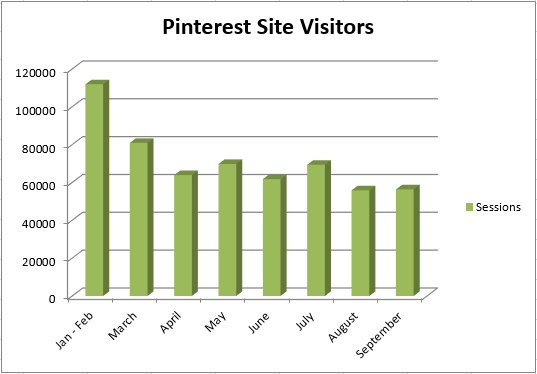 I’ve seen and been able to prove how powerful Pinterest can be for traffic. In fact, recently I’ve ONLY started building sites/working with clients that can benefit from Pinterest traffic. It doesn’t work for every niche though. If you’re willing to share (and because I’m curious), is your Pinterest site selling a physical product? Thanks for commenting LJ! The pinterest site does not focus on physical products…its in the crafting niche. Glad to see you are still doing well overall with the 4 sites despite 2 of them getting hit with the penalty. Even those ones are still making a little bit of money so like you said you could alway sell and get back the money you spent on them or something at least. After reading this now I don’t think it would be worth trying to save them, I mean if Perrin hasn’t had any luck, it doesn’t look good. His site really doesn’t have thin content at all and I can see how much he has done to try and recover it, so it doesn’t look good for the rest of us. I have been trying to do the same as him with recovering one of mine and have spent a ton of money hiring professional writers, but it still has no where near as much articles :(. I think I should have just bought a new domain, de-indexed the old one and move all the articles to the new one and kept adding content there. Do you think this could be an option for these 2 you purchased that got hit? Like you have been saying Authority sites are the way to go and staying away from PBN’s. I get how so many people are still all for PBN’s and how they CAN still work, but seriously how long will that last. Better of building a solid business and something you could be proud of and proud to share and outreach for to get those REAL valuable links. Thanks for update Spencer and good luck!! I agree Marin. Yes, moving the content to a new domain could be an option for these sites. I may consider that…and will let everyone know. How do you feel things are going to go when pengiun comes out? Not well for thin content or spammy link built sites. I think that overall your website acquisition strategy is still a success. As you said you learnt a great deal and you’re more confident for future acquisitions. I can’t see a better strategy than diversify the investment and time in multiple online projects….. look at Perrin, he put lots of effort on his website and now is taking a bigger hit. For now I’m full on scouting for new website acquisitions! Thanks Daniele…you are right, good deals are not always easy to find. Podcast spoiler alert! We actually just recently recorded an interview with Justin and Joe from the Empire Flippers and discussed that point :). That podcast will come out before the end of the month. I would be super interested in a mastermind group with website buyers. if everything is getting hit because of PBN links surely you have to address the way in which your PBN is set up. i know so many people who have up to 1000 and nothing has been hit because its super safe in regards to hosting/name servers etc. Can you be more specific with “so many people”? Glad that some of your sites are doing well. I am curious do you think that the sites that received the penalty now have worse levels of traffic than before you added PBN links to them? Like an extra slap from google for trying to game them? What do you think will be your plan moving forward will be, your authority or buy more? The sites get very little traffic from Google now; the traffic mostly now comes from others sources like Yahoo and Bing…so the quality of traffic is similar. My primary focus is building out the authority site, but I have a little extra time and money to buy some sites, so will continue to dabble. Spencer, I just want to say thank you for sharing the high’s and lows that you and Perrin have been through and sharing the lessons for us all along the way. This have given me confidence to get started, with all the bumps too. Wishing you every success to a bright future! Just my 2cents worth but wouldn’t it be a good idea to add to future income reports the costs you have incurred on these sites? Like the cost of adding more content etc. Sure, I can do that…perhaps when I sell I can give a full income/costs report. I’ve done this a little in the past, but don’t remember which report it was. Were you and Perrin experimented on how to increase conversion on single product page review for apennyshaved dot com ? I remember you said that site was near $4000 monthly, was the orders coming mostly from the homepage (comparison table) if so how much is that % compare to other single pages? Im asking you this cause my single page reviews are not converting well, its mostly the homepage that get more orders. sorry to ask too much from you.. this is my problem and im stuck with this since May..
A significant portion of the sales came from the chart; however, the entire site contributed quite nicely. We are also doing a post tomorrow about how to hire and instruct writers. Hope that helps! Currently i have a fulltime write, i thought she will be able to write better review cause shes fulltime but its not the cause, our part-timers are much better in terms of uniqueness, style, choice of words, etc.. worst part of our fulltime shes always late online ..
also if you can do a graphical review on how you increase your single product review page like what are the best sections, which section should come first and lay-out or design of the page.. or like trust signals for the visitors to really click and order from it..
i would really appreciate more input from you since you are more experienced… thanks in advance Perrin and Spencer. Okay, these are some additional ideas for a future blog post that we will keep in mind…thanks! Hey Spencer, re: Site #1 – Even at $100-$150/month in adsense income, on your initial $5K investment, that’s a 24-36% annual return on your investment. I know you had much higher hopes for it, but to me that’s still a very successful ROI considering/assuming how passive the site is likely to be at this point. Selling the site now just “to get your money back” seems a little shortsighted to me. It’s like Babe Ruth hitting a single but walking back to the dugout anyway because he didn’t knock it out of the park. Good points Brad. The only thing you may be missing is the opportunity cost. If I sell the site to recoup my money and can find a site that returns 100% on an annual return…that’s much better. Prior to the penalty, you can see that the site would have been very close to those types of returns. Plus this is a very small investment for me, the returns can be even greater in terms of real dollars if I purchase larger sites. I’ve read a lot of your blog posts lately. It’s not a good feeling to read this post. But I’m sure that you’ve got a lot of experience from last month. Well, keep going man! I hope you are making good money overall. These we are struggling big time. Maybe because our site is without seo. Really can’t wait to see if Perrin can recover aPennyShaved.com or not. Want to learn from it! Do you think that with a french websites we can make some earnings? Do you think that french websites can get the same importants like english websites ? I want to luch some niche websites but i can’t write a good content, i’m not an anglophone. I’m sure you can still make some money with French websites. Thanks for the update on the sites, personally i dont think sites ever really recover. Moving to another domain is a better option imo. Nice to hear in the comments that you recorded a podcast with empire flippers, looking forward to it! so i cant find keywords with a KC below 30 and usually i skip anything above 30 What im thinking of doing now is move up to 35 and focus even more on whether there are other niche sites in the top 10 etc What are your exact criteria? up to what KC number are you willing to go and what is more important? Would you rather have a keyword with KC 35 and 2 niche sites in the top 10 or would you rather have a very low KC with no niche sites/forums etc in the top 10? I would rather have a lower KC; however, a KC of 35 with a couple of niche sites in the top 10 is still very good. However, I feel like almost every market has long tail keywords below 30 KC. You may just have to get a bit more creative with your seed keywords…there should be options of keywords that are longer phrases. Like you said, this was going to be an experiment from the start. Though the recent downward trends are no good, it has been interesting to follow along and see which direction things were going to head. I’m sure all of us are always wondering if buying a money making site is really that much easier (and profitable) when compared to starting your own. These case studies help. What I can see is that you should sell site 1 and get your profit for it. You should keep the pinterest site forever. The earnings are very nice and I am happy to see your experiments getting successful despite the hit. I feel sympathetic towards people who always complain and talk bad about Google traffic. I mean you must agree that Google is the king of all kings now when it comes to gain majority of world traffic. You can not beat Google targeted traffic; no matter what kind of other so called traffic tactics you use. Google is not harsh upon honest and hard working webmasters. In fact, if you are well knowledgeable, honest and hard working in your niche, you can certainly get some serious Google traffic within few months. I agree that it can take up to 6-8 months to see some significant traffic to your site but it is really worth the wait. Once you become authority in your niche within first year, no one can stop you. If you adhere to all Google Webmaster guidelines and go by their terms and conditions of site development strategies, you are in safe hands. I mean with their current ranking algos, you don’t even have to try any greyhat/ blackhat tactics to rank your sites. What you really need is your 100% honest hard work, carefully written targeted content and selected specific authority links pointing to your site. Thats it. You do not require thousands of links in these days. This is my personal experience. Because one of my sites currently has only 11 articles and it is getting more than 3000 targeted buyer traffic per month. I agree this has taken me though up to 7-8 months to reach. But it is really worth your time investment. It will pay big in the coming years for sure if you keep the quality of your site very high. You can stay in touch with other webmasters in your niche for better exposure. Better Content Quality + Few Specific Niche Links + Better Relations with Other Niche Webmasters = High Rankings and Increased Revenue for Your Authority Sites. And the best thing of all is once you have this big authority site at your hand, it is very easy to recover from any negative seo attacks. You can recover your site rankings much faster as compared to other thin content 2-3 page crappy sites. Thanks for your thoughts Vishal. Are there any Long Tail Pro users here? I’m trying to figure out if my fetch keyword issue is specific to me or is anyone else having it. LTP has been great but suddenly around August fetch keyword has really been a headache. I haven’t been able to finish the fetching process using seed keywords if I enter more than 1 seed. It always seems to get get stuck in GKP and I have to keep clicking on “tools > keyword planner” in the show planner window for it to maybe continue to the next seed. Sometimes it takes 30 minutes to run 10 seed keywords this way. It always seems to get stuck. The only reason I’m asking is I’ve been back and forth with the support team for a month now I more or less, and uninstalled, re-installed, done the show keyword planner, delete the campaign, etc. and everything still no luck. Looking for some help. I really prefer using LTP over GKP since you get more results there per run. Usually if your issue isn’t resolved after a few back and forth tickets with our Long Tail Pro support team, they will offer to do a skype/screen share call with you. If you have not done a call with them, please respond and request a skype call. This usually will resolve any remaining issues. I will just say that the software is working as expected for the huge majority of users, so your issue is not normal. However, we do our best to resolve and help when these less common issues do occur. Insightful post as always Spencer. The road is always full of obstacles but that’s part of the journey right. I wonder if the guy who had copied apennyshaved (in french) has been hit. I’ll check that out. He / she would deserve to receive 30 000 low quality backlinks to get out of the picture..
What I’ve tried so far is 2 adsense blocks 336×280 at the end of the article and that’s it. I’ve not put in any on top so far. Anyway, you’ve got great returns for your adsense even though the one you mention has been hit lately. It goes to show that you can duplicate this at anytime, with success. Good luck on trying to recover from the penalty. If one person can do it, it probably is you. Thanks Alain. Some of the layouts in the post you referenced may be slightly outdated; however, the general principles are the same. Ads in the top left or right, tend to get higher clicks. You will like need to move an ad into the top area of your posts before you make decent money with Adsense. Thanks Spencer, much appreciated. I’ll try that and adjust as I go along. If you sold the penalized site, is that something you have to disclose to the potential buyer? Why would amybody knowing buy a penalized site? Absolutely. I would be 100% upfront about everything. You gotta take a look at this site unrasageaupoil.com which is clearly a french copy of aPennyShaved. That’s a shame. Always motivating to read your posts Spincer. I finally made the plunge and bought my first site and my anxiety is through the roof haha! I cannot wait until I am at your level and generating the size of revenue you are. Way to take the plunge! Keep taking action…and best of luck! For the site that gets traffic on Pinterest, are you doing any active promotions on Pinterest or the traffic’s for free? The only thing we are doing is pinning new images every once in a while to pinterest…nothing else. I know the sites URl’s need to be kept secret, but can you idicate the niche that the Adsense site is in as detailed as possible? I ask because im curious about the click through rate and what industry it relates too. I have followed all your posts, apologies if you have already answered this, I missed it if so. The site is in the electronics niche; for a small product. Hope that helps. 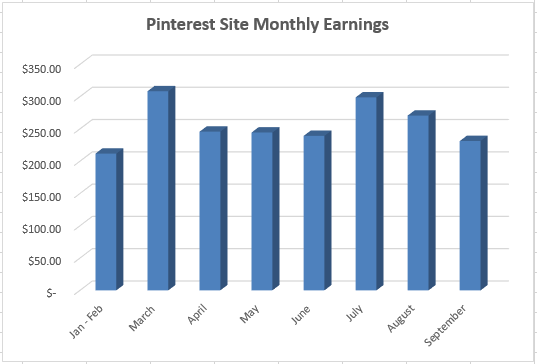 Why would you not monetize your pinterest site with Adsense? 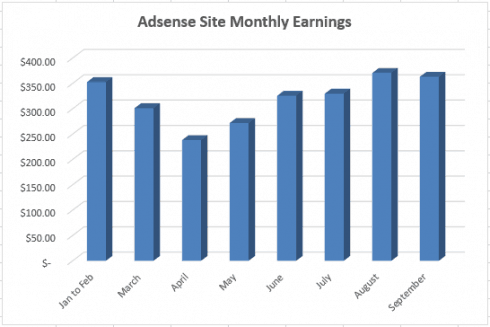 You might have mentioned it somewhere before, but adsense pays much higher CPMs than anything. Are you worried about the traffic source (social media vs organic traffic) and Adsense banning for that reason? Yes, I mentioned it somewhat in depth in this post: https://www.nichepursuits.com/case-study-buying-websites-and-strategy-to-increase-earnings/. Basically the site was banned from Adsense before I bought it, and I knew it. Read the post for all the details. What is your current link building strategy Spencer? I really like your website. I got lots of information on making money online. I am proud member of Long tail pro also. I also purchased Rank Hero on your recommendation but lucky I did not use those link to money sites (used as a 2 nd tire link building). First, I’m pretty confident you will be able to make SEO work with no PBNs at all… b the way, did you see any drops/ups in rankings over the last 2-3 days? Looks like another google update has been released, looks like it’s pretty big. I haven’t noticed…although it does look like Penguin 3.0 has been rolling out. I believe you will make a comeback from your authority site experiment! It is good that you have already diversified your portfolio with Pinterest sites. This is really important because keeping all eggs in the same basket is always a huge risk. Similarly you have also diversified your revenue source by adding Media.net and Infolinks along with Adsense. I have been reading your posts for quite some time and I always feel good to see your earning reports. I have already moved to PPC due to Google’s Zoo updates but it is good to keep reading about what’s happening and working in SEO. Sorry for posting this here Spencer but comments were closed in the relevant post. Regarding your new LLC for adsense, didn’t you have to enter your real name when submitting a W9 through google? The part where it asks you to enter your signature by typing your name. Yes, I suppose I did. Still seemed to work…my adsense account is alive and well about 3 years now after opening it. Glad you still make money with all the sites you bought. Even your sites hit by google updates, still they are performing. I would love to see if you leave your sites running and monitor how much they will make? Then, only we can ever see the potential the sites will make. Thanks for another round of income report. Yep, I’ll continue to monitor and share. I would be interested to see a post or case study about generating traffic from Pinterest. I think there is big potential there for traffic.